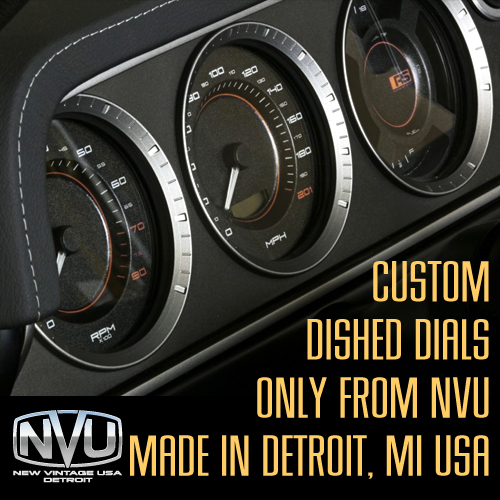 Here at NVU we provide the highest level of customization available ANYWHERE. 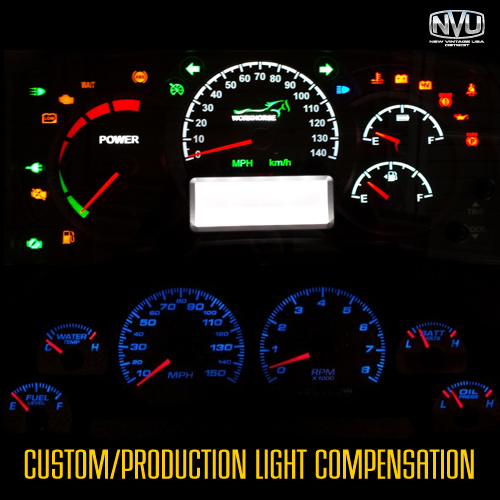 Custom graphics, backlit, multi-color, contoured dials, shaped lenses and icons like a modern OE vehicle. You name it we can do it. Check out the competition and compare what is possible. Below are some examples of past projects for inspiration. Take a look at our FLICKR account for some of the latest custom and side projects we have been working on before they hit social media or this page. 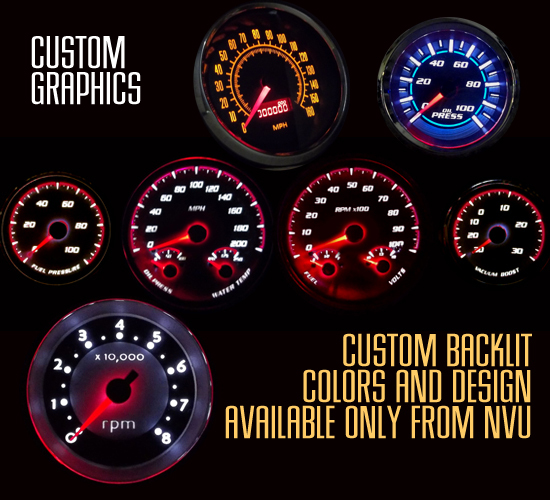 Now you can add custom graphics/logos to your startup screen on your Phoenix gauges with OLED screen. 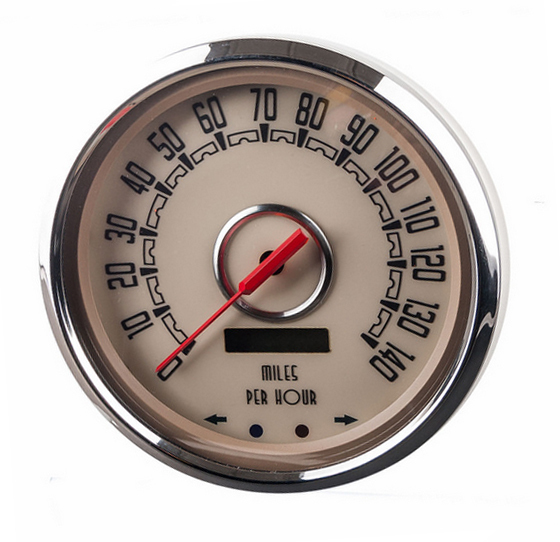 We can also customize your inputs with custom ranges and graphic readouts on your Phoenix OLED screens. 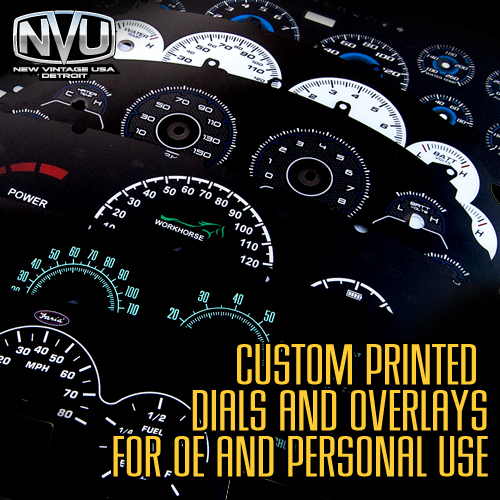 NVU custom screen print dials to customer specifications, not a digital print. 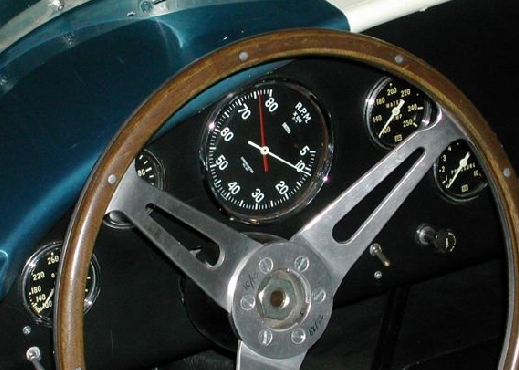 We also use thesame techniques for our OE cluster dials and commercial applications. You tell us what you are looking for. The better the description, the quicker we can design something. Every customer who places an order receives a full size proof sheet via email that shows EXACTLY what is going to be created. The proof sheets are made from the actual files that we send to be screen-printed. Images of the final parts are emailed to you before we ship. 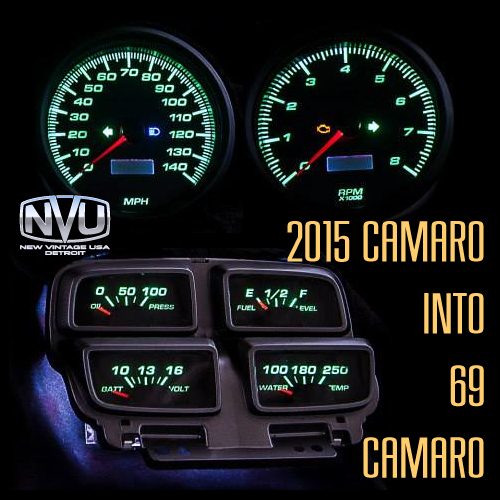 We want to make sure that your parts are completed exactly as you want. 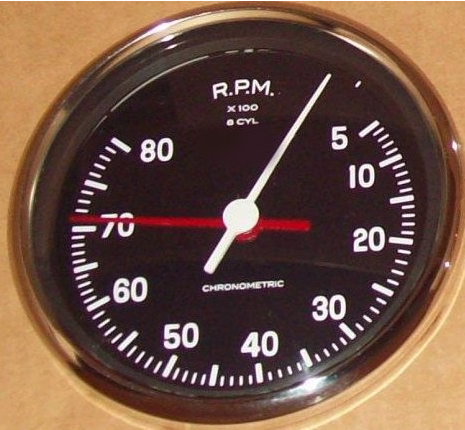 Below is our most popular customization, adding turn signals and indicators in the 4-3/8" Woodward speedometers. 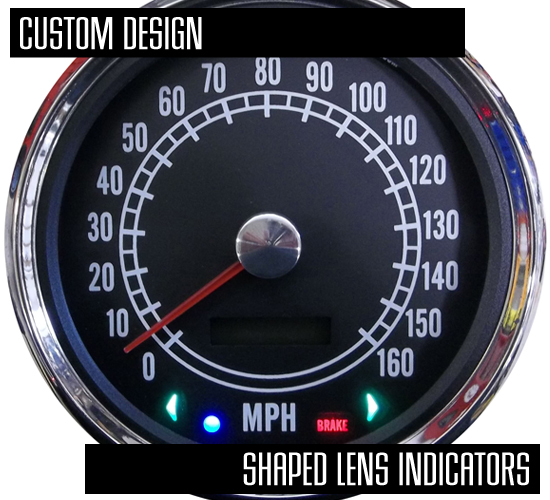 We create a shaped lens and install colored LEDs in an OE process that give a clean, original look, no more drilled out dials with LEDs sticking through! 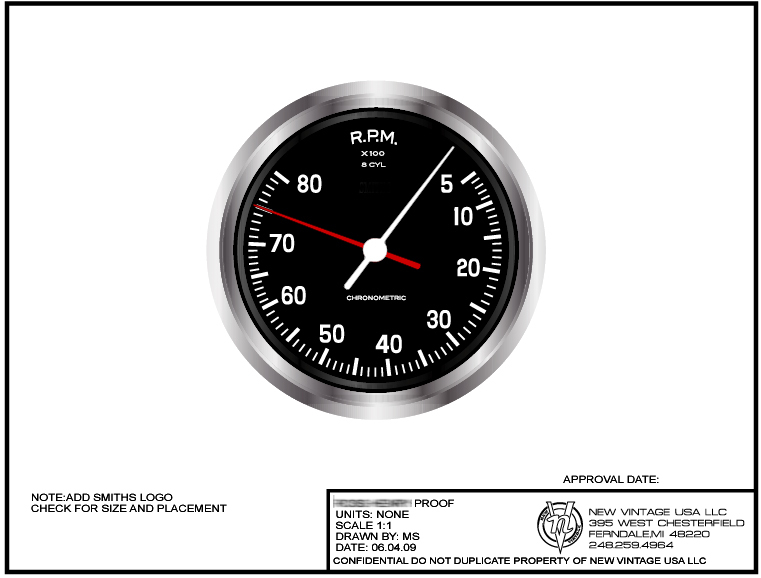 Custom backlit metal effect dial with offset LCD and built in indicators. 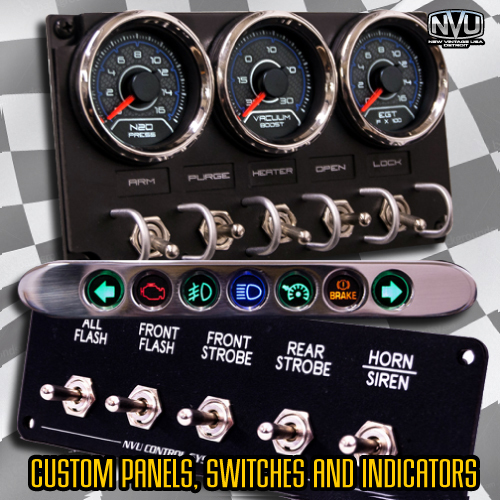 Combine a custom indicator, switch or mounting panel with gauges for a complete custom setup. 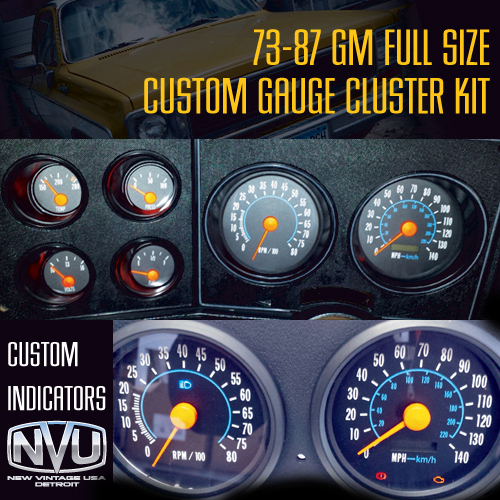 Below: We can also custom print overlays for existing clusters to create a unique look without changing out the internals. 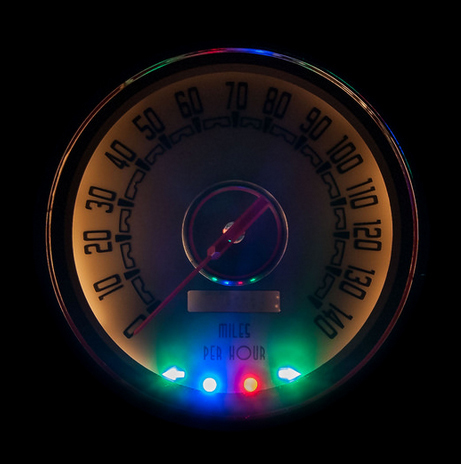 Great for newer vehicles that have integrated systems that require the cluster to remain in place. One offs, low or production volumes. 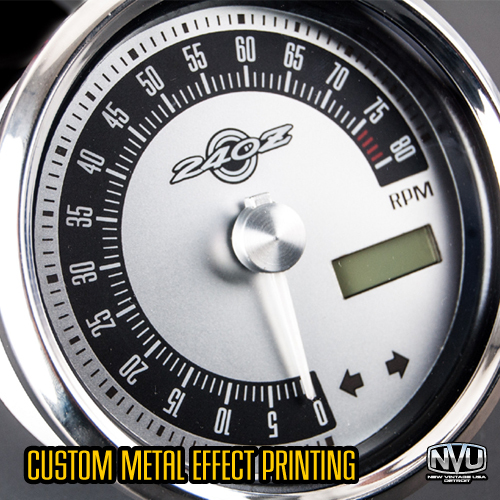 For more on the process and how we do them take a look at our Printshop page. 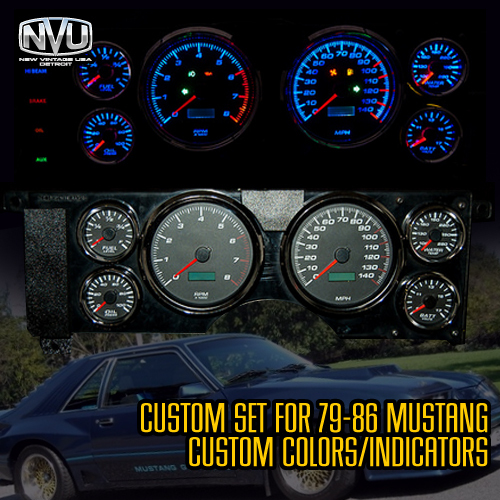 Start with one of our 79-86 Fox Mustang kits, add indicators and redline. 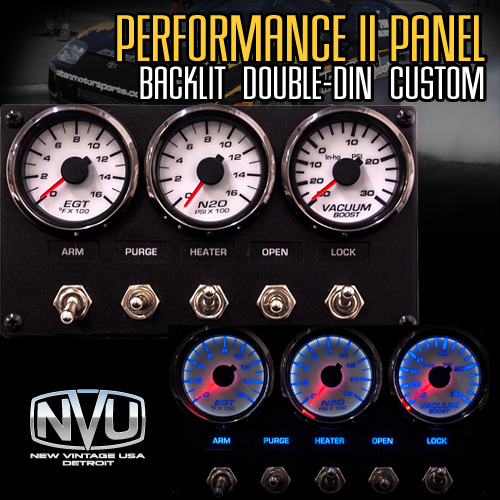 Combine custom gauges and a one off switch panel for an add on that looks as good as it works. Why not do a custom overlay to and add on some additional functions? 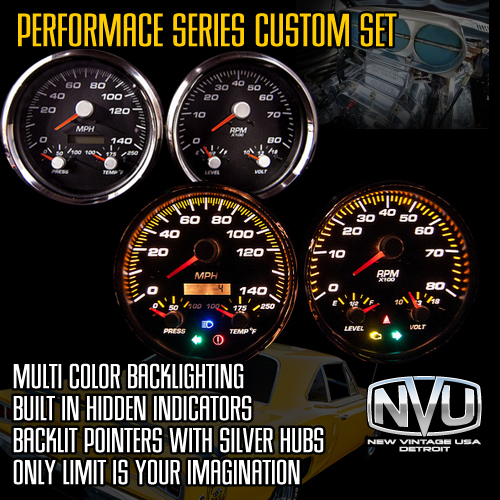 Custom mounting bracket with indicators crates a performance look in an professional package. Mild to wild. 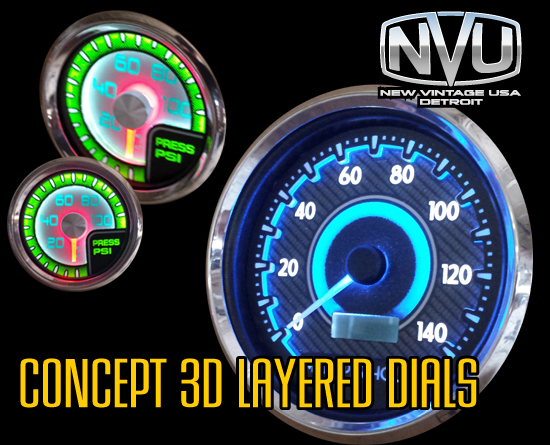 3D layered dials backlit. Seen anything like this? 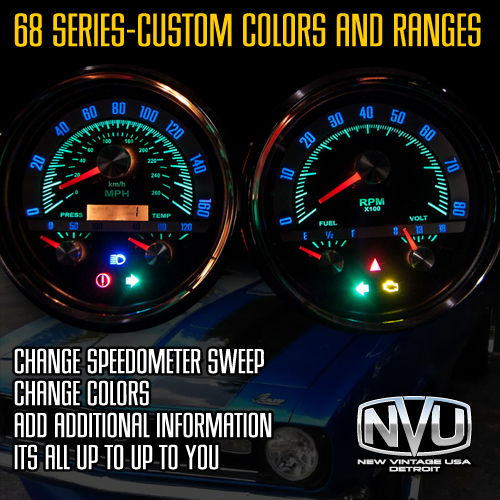 Vartiations on our 68 and Performance series, added functions and night colors. Make a statement day and night with this set. 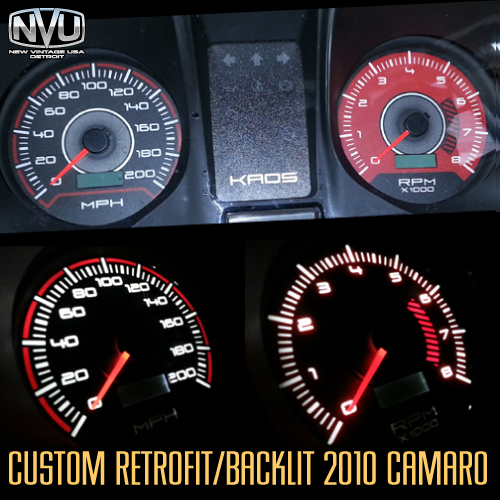 Another 2010 retrofit. 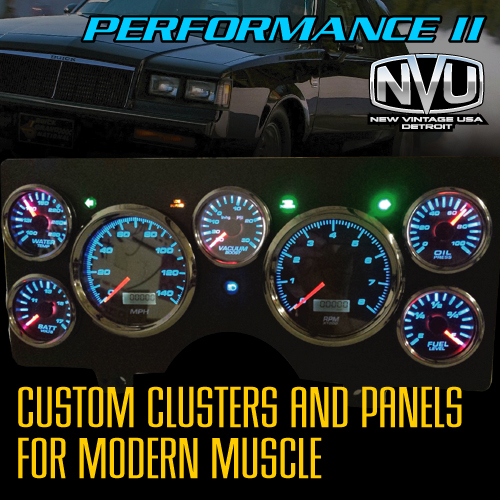 Performance series graphics with lime green lighting. 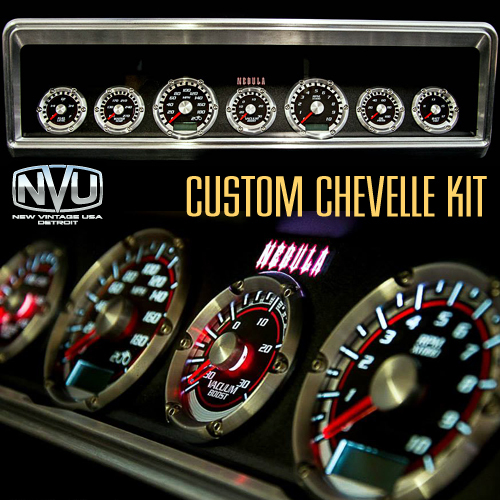 Full on custom Chevelle dash. Every part on this one is a one-off. 100% custom, not one part is off the shelf.